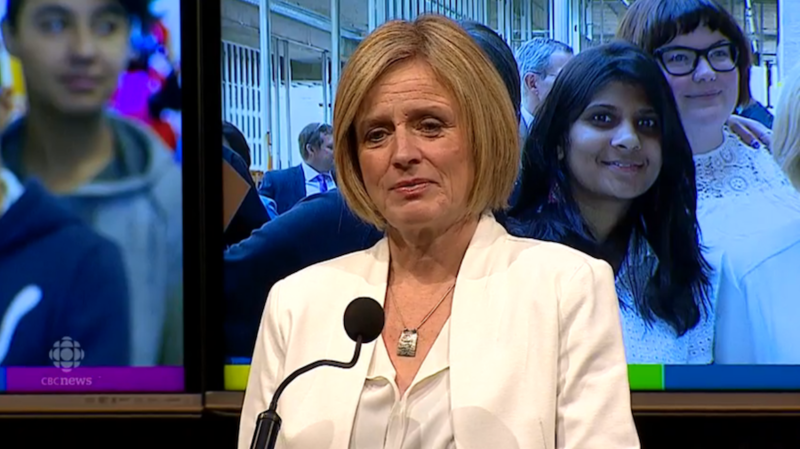 Alberta Premier Rachel Notley (Screenshot from CBC). During her annual state of the province speech, Alberta Premier Rachel Notley said that before the end of the year her government will roll out specifics of its plan to phase out coal-fired electricity. The project, which is part of a larger climate-change plan outlined in 2015, will include financial help to coal emitters closing their plants and transitioning to cleaner forms of power. "And we will set out more detail on how we will promote the construction of clean, renewable energy — wind, solar, thermal and hydropower — efficiently, economically and without undue subsidy," Notley said. The premier has promised to end coal-fired electricity generation by 2030. Her administration’s strategy also includes a broad-based carbon tax whose implementation starts in January and is expected to bring in around $3 billion. The tax will increase gas prices at the pump and home heating bills, although lower- and middle-income earners will receive partial or full rebates.